In what many have described as the best Chelsea Flower Show since the mid 90s, the judges of the 2007 show have awarded Bradstone as the Best Show Garden. The garden belongs to an astronaut on a 600 day tour and explores the psychological importance of man’s relationship with the environment. 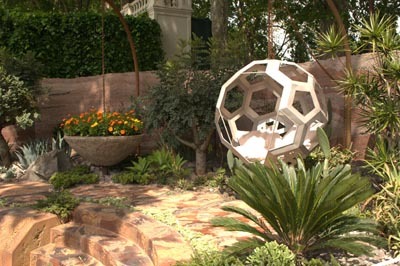 Entitled ‘600 Days with Bradstone’, the garden was inspired by the Millennium and a new era in scientific and design idioms. It took eight years of research to put together, with input from the European Space Agency and the British Science Museum. Sarah Eberle, the garden designer, selected plants for their contribution to biomass and the carbon oxygen cycle; medicine and food and their psychological support.